"Northern lights put in a brief appearance before moonrise this morning over northwestern Montana," reports Ashley. 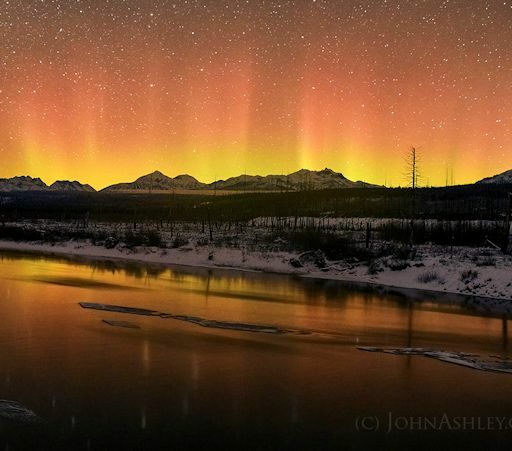 "Light beams over Glacier National Park reflected nicely in the icy North Fork River at a balmy -4 degrees F."
"The lights were visible for less than an hour," he says, "faint enough that I could not detect any color with my old eyes. My camera was more effective, picking up yellow and magenta, but interestingly none of our most common color, green." To photograph these faint but lovely auroras, Ashley used a Nikon D750 digital camera set at ISO 3200 (f2.5) for a 25 second exposure. Other photographers may wish to take note of those settings because more auroras are in the offing. NOAA forecasters estimate a 40% chance of geomagnetic storms on Jan. 4th, waning to 25% on Jan. 5th. A coronal mass ejection (CME) expected to hit Earth on Jan. 3-4 did not. It appears to have missed, sailing wide of our planet. As a result, NOAA forecasters have downgraded the chance of a geomagnetic storm on Jan. 5th to 25%. Coronal holes are places in the sun's atmosphere where the sun's magnetic field opens up and allows solar wind to escape. 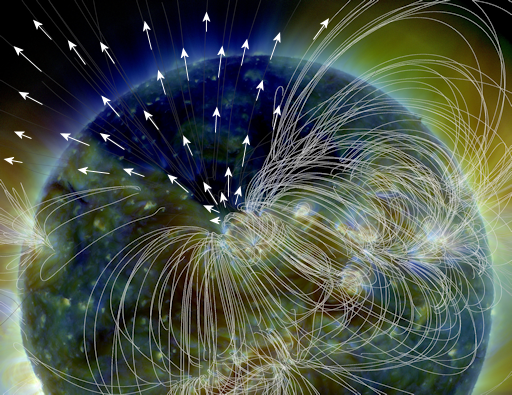 White arrows indicate solar wind plasma flowing into space. 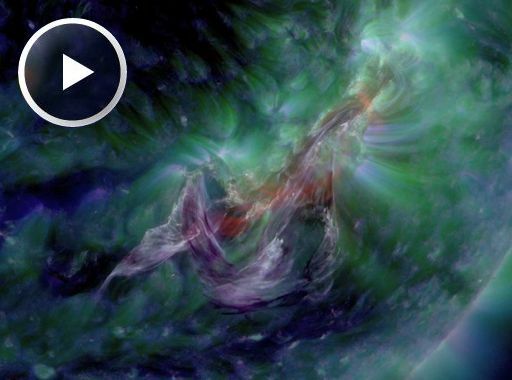 A stream of solar wind flowing from this coronal hole could reach Earth as early as Jan. 6th. According to NOAA forecasters, there is a 60% chance of G1-classgeomagnetic storms when the solar wind arrives. High-latitude sky watchers should be alert for auroras on Jan. 6-7.
voor degenen die de zon interressant vinden, hier een link naar een (in mijn ogen) zeer eerlijk en goed YouTube kanaal. 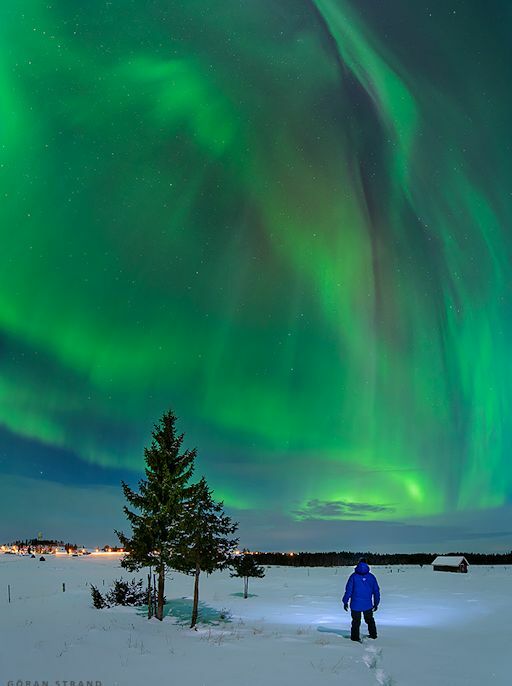 "The coldest day this winter gave us an evening with clear skies and magnificent auroras," says Fyhn. "The show was worth my cold toes." The display was caused by a high-speed stream of solar wind, now buffeting Earth's magnetic field. Earth will probably remain inside the stream for another ~24 hours, so more auroras are in the offing. "I had a rare shot with auroras and light pillars in the same image," says Pietikäinen. Light pillars are a common sight around northern cities in winter. Urban lights bounce off ice crystals in the air, producing tall luminous columns sometimes mistaken for auroras. 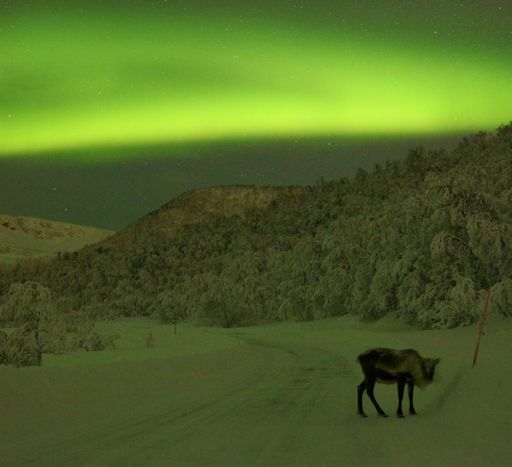 "The night air was filled with ice crystals as the temperature dropped to -35 C," he says. 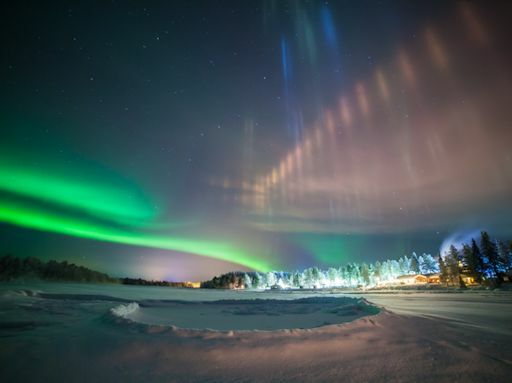 "This created stunning light pillars on top of the Hotel Harriniva. The funny crater in the foreground is because the ice has frozen unevenly in the river, creating a small pond that overflows water regularly. Water with slush freezes on top heightening the crater walls." 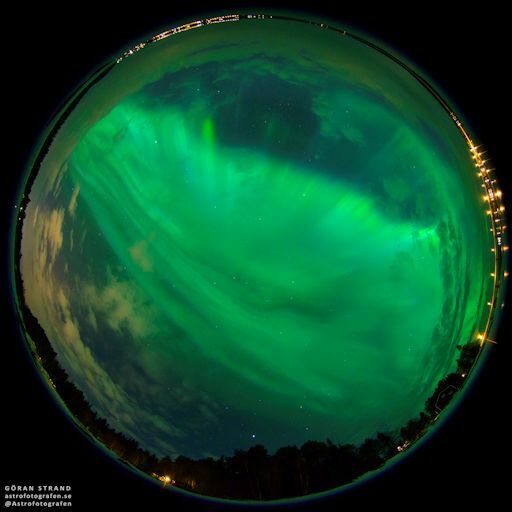 "It's quite nice to live in the aurora zone," says Pietikäinen, "every evening is different." Debris flying away from the blast site ripped through the sun's atmosphere and created a coronal mass ejection (CME). Newly-arriving coronagraph imagery suggests that the CME will not hit Earth. However, this preliminary conclusion could be overturned by further analysis, so stay tuned. 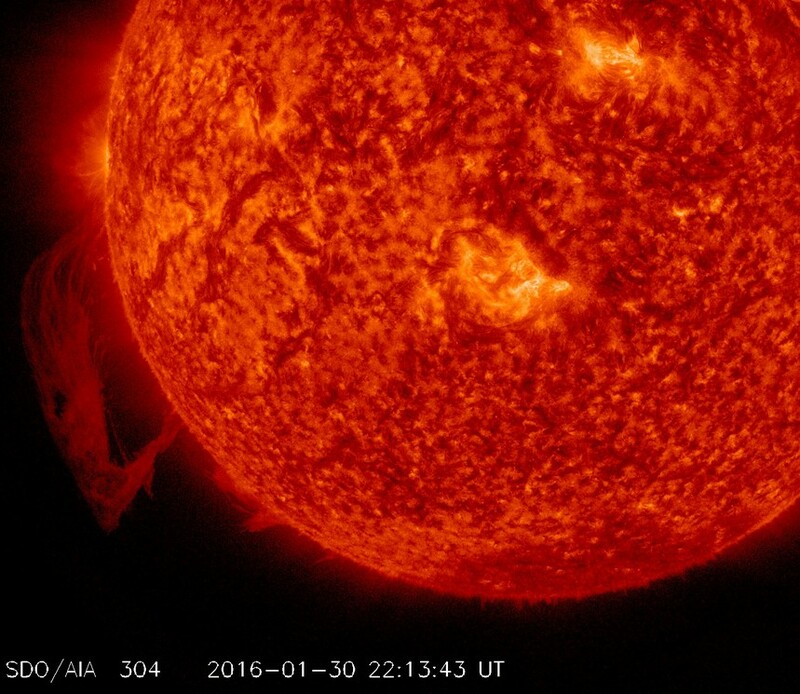 A large plasma structure known as a prominence is putting on a show for solar observers on Saturday. The prominence is located off the southeast limb and could liftoff during the next several hours. These events can sometimes lead to bright coronal mass ejections, however due to the non geoeffective position, would likely be directed away from Earth. Still a nice looking solar feature on an otherwise quiet day! 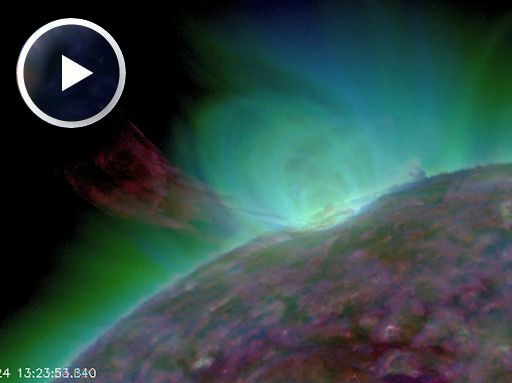 "With solar activity so low, what triggered this amazing display?" asks Wright. Answer: The interplanetary magnetic field (IMF) near Earth has tipped south, opening a crack in Earth's magnetosphere. Solar wind is pouring in to fuel the display. 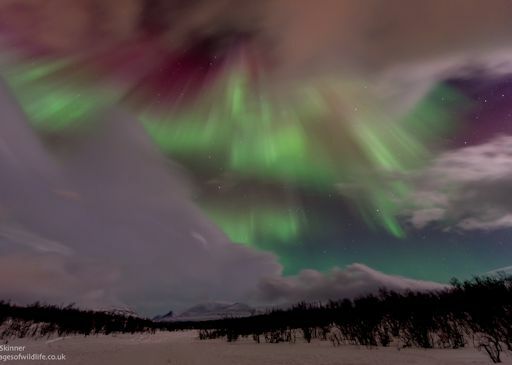 Arctic sky watchers should remain alert for more auroras on Jan. 31-Feb. 1st. The display was caused by a stream of solar wind pressing against Earth's magnetic field. Earth is expected to exit the stream on Feb. 6th, so the lights should subside later today. The next outburst of auroras could come on Feb. 8th when Earth crosses through a fold in the heliospheric current sheet--a so-called "solar sector boundary crossing." NOAA estimates a 40% chance of polar geomagnetic storms when the crossing occurs. "The outburst lasted less than 4 minutes," says Layos. "It was magnificent." 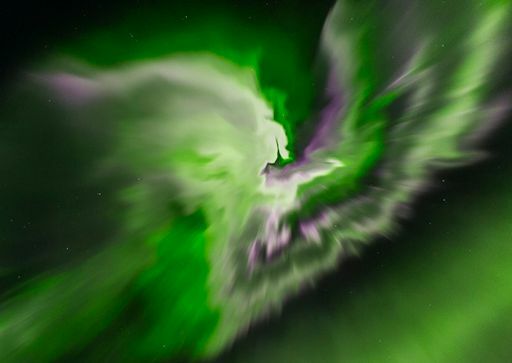 What makes this solar wind stream such a prolific producer of auroras? The answer lies in its magnetic field. Forecasters call it a "negative polarity stream." In other words, the magnetic field of the solar wind tends to point in a direction which opposes Earth's magnetic field: North vs. South. This mismatch opens a crack in our planet's magnetosphere. 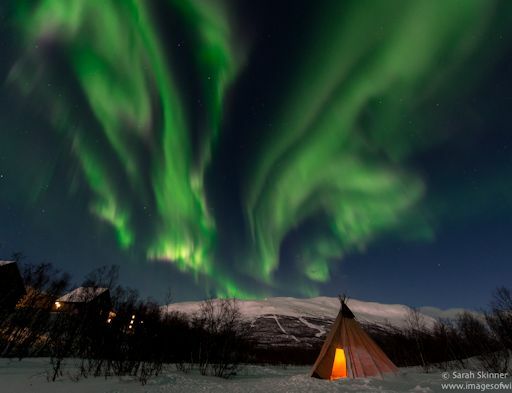 Solar wind pours in to fuel bright Northern Lights. The odds of auroras are declining as Earth exits the solar wind stream. 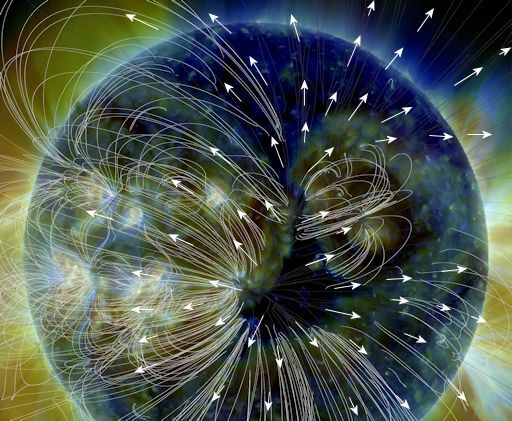 NOAA forecasters estimate a 50% chance of geomagnetic storms today, declining to 30% on Feb. 20th. Earth is exiting a stream of solar wind that produced an outburst of auroras on Feb. 16th through 18th. 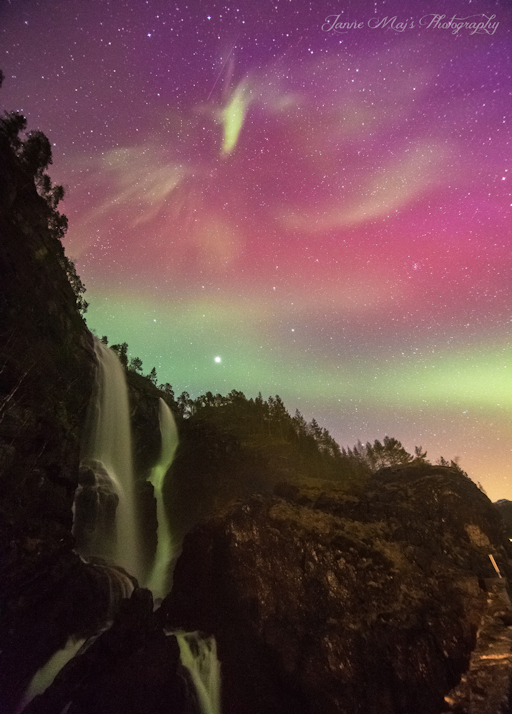 Good news for photographers: The next stream of solar wind is already on the way. It is flowing from this coronal hole, photographed today by NASA's Solar Dynamics Observatory. Coronal holes are places in the sun's outer atmosphere (or "corona") where the sun's magnetic field opens up and allows solar wind to escape. The flow of solar wind along "open field lines" is indicated by white arrows in the false-color image above. 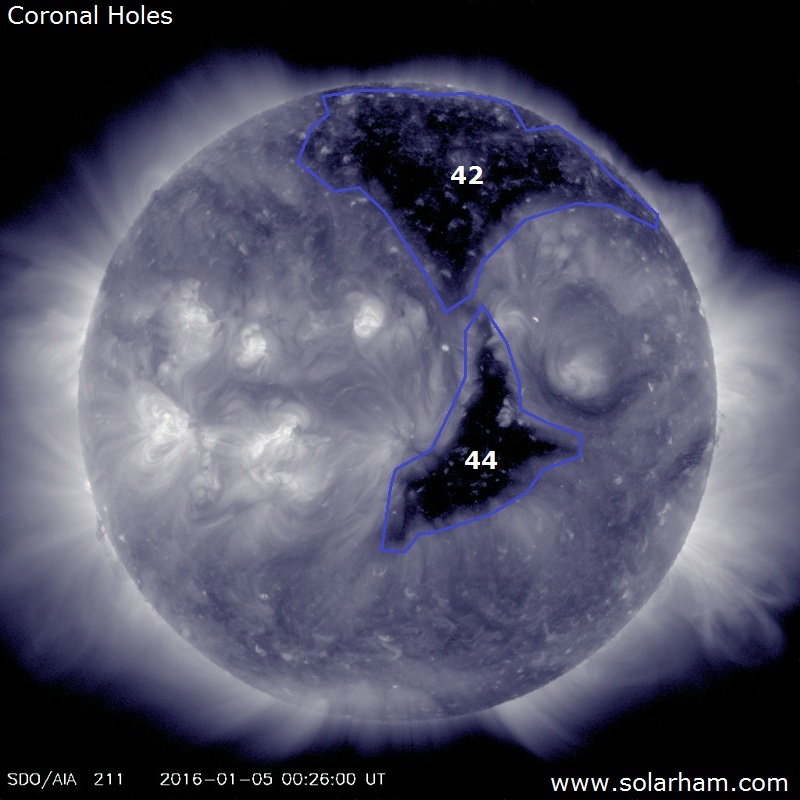 Coronal holes are not rare. They open up several times each month. 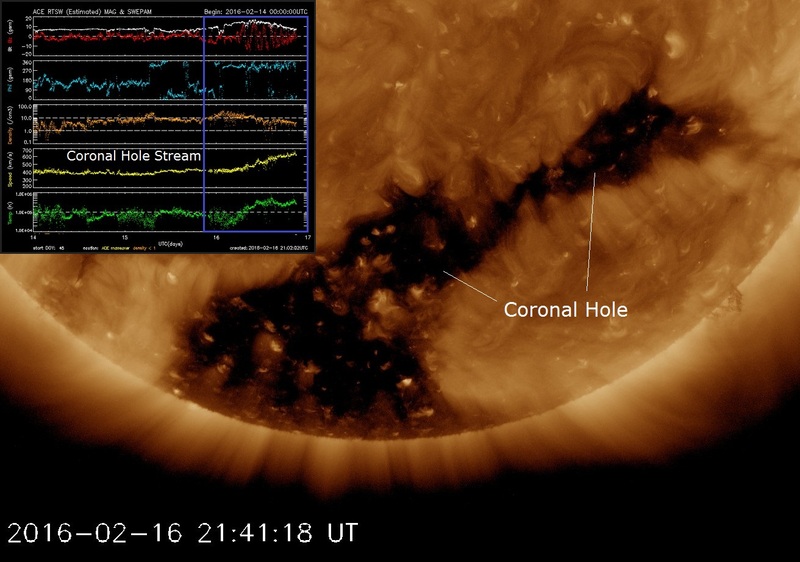 Solar wind flowing from this particular hole could reach Earth on Feb. 23-24. Arctic sky watchers should be alert for auroras on those dates. There was no geomagnetic storm last night, but sometimes geomagnetic storms are not required for bright auroras. 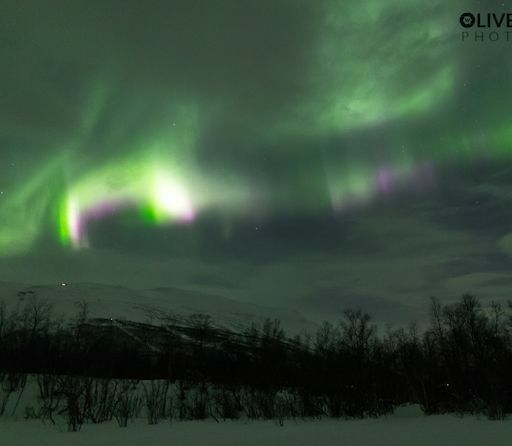 "On Feb. 23rd we witnessed a mind-glowingly beautiful display," reports aurora tour guide Sarah Skinner of Abisko, Sweden. "At first the auroras were faint. Gradually they increased in intensity until--BOOM!--the sky was filled was rapidly dancing lights." "The shapes and colours were amazing," continues Skinner. "Guests literally screamed with excitement, as did I!" The cause of the outburst was not a CME or other solar storm. Instead, the interplanetary magnetic field (IMF) near Earth tilted south. This gentle event openeda crack in Earth's magnetosphere. Solar wind poured in to fuel the display. During solar minimum the Sun's magnetic field, like Earth's, resembles that of an iron bar magnet, with great closed loops near the equator and open field lines near the poles. Scientists call such a field a "dipole." The Sun's dipolar field is about as strong as a refrigerator magnet, or 50 gauss. Earth's magnetic field is 100 times weaker. During the years around solar maximum (2000 and 2001 are good examples) spots pepper the face of the Sun. Sunspots are places where intense magnetic loops -- hundreds of times stronger than the ambient dipole field -- poke through the photosphere. Sunspot magnetic fields overwhelm the underlying dipole; as a result, the Sun's magnetic field near the surface of the star becomes tangled and complicated. Above: Steve Suess (NASA/MSFC) prepared this figure, which shows the Sun's spiraling magnetic field from a vantage point ~100 AU from the Sun. Earth has a magnetic field, too. It forms a bubble around our planet called the magnetosphere, which deflects solar wind gusts. (Mars, which does not have a protective magnetosphere, has lost much of its atmosphere as a result of solar wind erosion.) 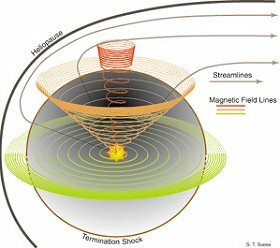 Earth's magnetic field and the IMF come into contact at the magnetopause: a place where the magnetosphere meets the solar wind. Earth's magnetic field points north at the magnetopause. If the IMF points south -- a condition scientists call "southward Bz" -- then the IMF can partially cancel Earth's magnetic field at the point of contact. "When Bz is south, that is, opposite Earth's magnetic field, the two fields link up," explains Christopher Russell, a Professor of Geophysics and Space Physics at UCLA. "You can then follow a field line from Earth directly into the solar wind" -- or from the solar wind to Earth. South-pointing Bz's open a door through which energy from the solar wind can reach Earth's atmosphere! 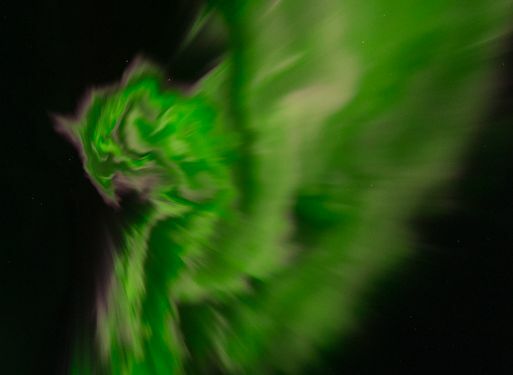 Southward Bz's often herald widespread auroras, triggered by solar wind gusts or coronal mass ejections that are able to inject energy into our planet's magnetosphere. After a rainy day, the clouds broke. Nothing could have prepared me for the colors I was then about to witness!!" says Skinner. "As the aurora developed the most intense reds I have ever seen appeared. Reds, purples, greens, so many colors; I could not believe what I was seeing." CIRs are transition zones between slow- and fast-moving solar wind streams. Solar wind plasma piles up in these regions, producing density gradients and shock waves that tend to ignite auroras when they strike Earth's magnetic field. The CIR has passed, but more lights are in the offing. Earth is moving into a stream of high-speed solar wind following behind the CIR. In response, NOAA forecasters say there is a 65% chance of polar geomagnetic storms on March 15th. This is called a "corona"--a spray of colorful lights seen by observers who look straight up into the folds of auroral curtains. "There were no less than 6 corona events that night!" says Van Hellemont. "This spectacular specimen showed a lot of movement. It was fantastic." The stream of solar wind which caused the display has been especially effective at sparking auroras. The reason: Magnetic fields inside the stream have a negative polarity. This means they can link to Earth's magnetic field, opening a crack in our planet's magnetosphere and allowing solar wind inside. Auroras inevitably follow. NOAA forecasters estimate a 40% chance of additional G1-class geomagnetic storms on March 18th as the solar wind continues to blow. 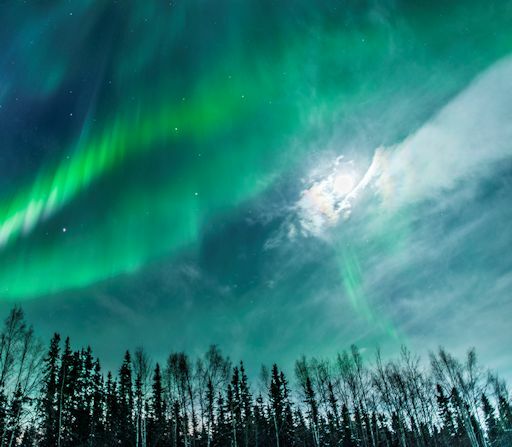 "The auroras were brighter than the surrounding moonlit clouds," says Obudzinski. "It was a fantastic display despite most geomagnetic predictions signaling quiet conditions for last night. You just never know!" Indeed, this is the time of year when you just never know. For reasons that are only partially understood, the weeks around equinoxes favor geomagnetic storms. Even a gentle gust of solar wind can spark a magnificent display. Stay tuned to the photo gallery for more Spring Green. "This is an all-sky photo showing the entire sky at 23:19 UT on April 2nd," says Strand. "Northern Lights were everywhere!" 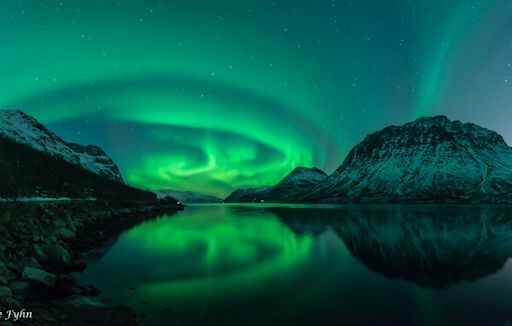 In high latitude places like Sweden, spring twilight is beginning to intrude on the midnight sky, making auroras increasingly difficult to see. "Aurora season is quickly running out," laments Strand. " I hope to see some more before the bright nights return." He may get his wish. Another stream of solar wind is on the way, due to reach Earth on April 5th. Moreover, the incoming stream is filled with "negative polarity" magnetic fields. Such fields can easily link to Earth's magnetic field, opening a crack in our planet's defenses against solar wind. This sets the stage for a new round of Arctic lights early this week. "I've waited for so many years to take this picture, because the Northern Lights has never been high enough in the sky before," says Nagelsen. "It was amazing." Many people have never heard of the heliospheric current sheet. It is one of the biggest things in the solar system--a vast undulating system of electrical currents shaped like the skirt of a ballerina: picture. Earth dips in and out of it all the time. NOAA forecasters estimate a 55% chance of continued storming on April 8th as Earth slowly exits this region of space. High-latitude sky watchers should remain alert for auroras.